Olympics stardom is nothing new — the games thrive on fan-powered viewership, and those stars in turn bring their teams (and by extension, their countries) a level of legitimacy and glitz, which turns the Olympics into a full-blown celebrity event. Every generation, there's a handful of standout stars who win the hearts of viewers at home and around the world. But more rarely, one of those stars isn't just a celebrity, but acts as a harbinger of change and progress. That's why Simone Biles' status as the "greatest gymnast of all time" is so important. Rather than being "the greatest Black gymnast of all time," she is simply "the greatest," proving that racial perceptions are shifting and becoming less important in how the world views its stars. 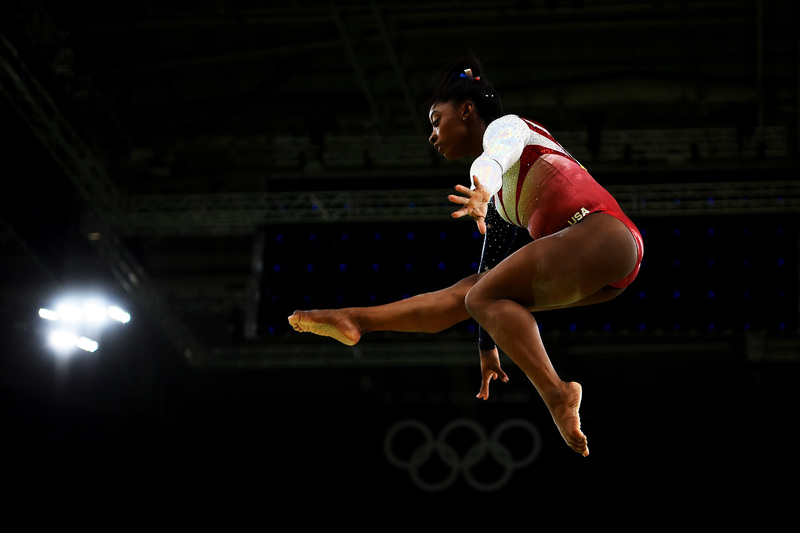 Although the Olympics have just begun, Biles is already being lauded as the star of the incredible U.S. women's gymnastics team, which has been called the "best of all time" this year. Even before her stunning performances in women's gymnastics floor, vault, uneven bars and balance beam events, some were already calling Biles the greatest of all time, and with her career-making exhibitions, it's easy to see why. One need only watch her insane floor technique or how many times she manages to flip in the air to see why she’s so important. In the lead up to the 2016 Olympics, Biles had already made history as the first woman to win three consecutive all-around titles, and she has won 14 World Championship medals as well. As she's poised to continue her history-making streak, the significance of her dominance highlights the non-athletic aspects of her rise to fame as well. Biles, along with her teammate Gabby Douglas (who made history at the 2012 Olympics when she became the first Black gymnast to win an all-around championship), represents not only the changing definition of what it means to be a gold medal-winning gymnast, but also stands as a testament to the growing irrelevance of race in the eyes of the American public. This moment is seminal. We are a nation with a Black president, where Black people can and do thrive in business and every other aspect of the American dream, but discrimination still exists. And in a country where race matters, it's often a relief to watch narratives like Biles', where race is not the dominant factor. I never think of it as, ‘Oh, I’m the first African-American to win [the world championship]. Everyone just shoves that in our heads. I never think, like, ‘Oh my gosh, I am the first this, I’m the first that.’ I just do my gymnastics because I like to have fun. I don’t bring race into it. Biles' adoptive father, Ron, said that although she could well be considered an inspiration for young African American girls, she doesn't see it that way. Rather than making Biles' extreme talent and potential as the greatest gymnast of all time about her race, most Olympic commentators simply refer to her as "the greatest." Her meteoric rise has little to do with her race, which is a decidedly American phenomenon. As recently as ten years ago, she and Douglas would have been considered "the best African American gymnasts of all time". Now, they are simply the best. To live in a world where the greatest gymnast ever is Black proves that, despite continued racial strife on our own shores, we certainly have come a long way.